The London Restaurant Festival is now in its tenth year apparently. Now that I have been along and tried some of the food on offer I wish I had known about this sooner – and I will certainly be back to try more of the experiences on offer next year. But let’s start at the beginning. The London Restaurant Festival runs from 1st -31st October each year. Restaurants in London are asked to provide a specially priced menu for the event and you can see the full range of meals and experiences on offer on the Bookatable site, which coordinates the bookings for this major event. I was asked to review one of the restaurants from this year’s London Restaurant Festival, and I had a free choice of dates and venues. My bill was refunded for this meal, but all opinions are my own. I decided to make it a special date night for my husband and me. He works very hard, and just recently he has been putting in a lot of extra hours on a special project, so I wanted to wait until he was just about finished with that, and then treat him to something special. So, we didn’t get to try out our London Restaurant Festival booking until nearly the end of October, and from what I have seen, we will certainly be doing this again next year, hopefully visiting several different restaurants and venues over the month. 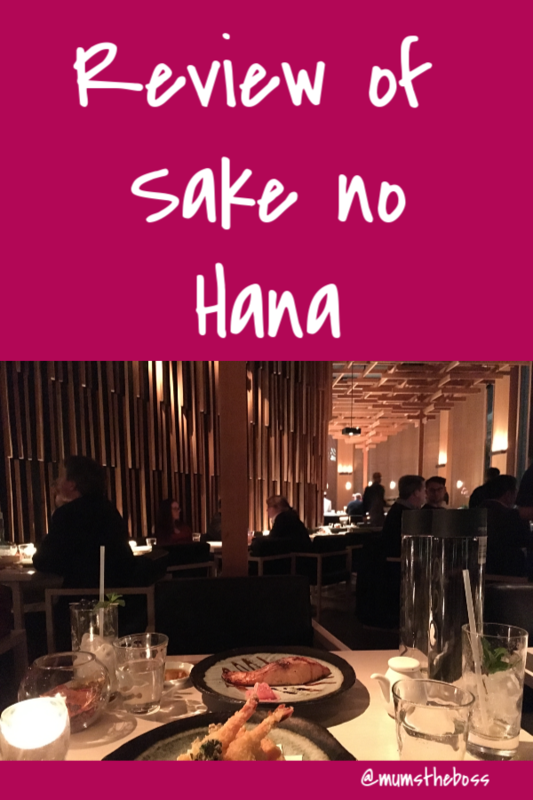 The restaurant we chose to review was Sake No Hana near Green Park station – and the offer that they had was 5 courses plus a half bottle of wine for £34 per person. This tasting menu is available at other times of the year too. So we arrived at the restaurant at 7.20, and were greeted warmly and shown to our table. The decor is very calming and stylish, and I think very Japanese, although I haven’t been to Japan so I couldn’t say for sure. 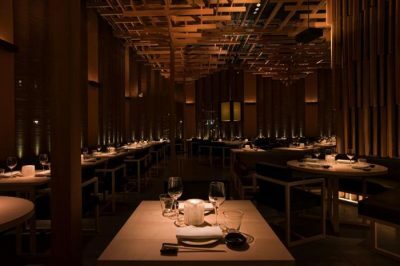 My husband was a little bit nervous, and certainly not comfortable with me taking photographs in such a fancy restaurant, so for a picture of the venue I have borrowed a snap from Sake No Hana’s entry on the Bookatable site. We neither of us fancied wine, so we asked what we could have instead, and were shown the page of non-alcoholic cocktails. We both chose the Kyoto Garden cocktail (which was yummy) and had a bottle of sparkling water to go with it. Then we were offered a hot hand towel each to start the meal, served on cute little bamboo serving trays. So what did we have to eat? They were served with wasabi and ginger. The waiter served us each a little bowl of soy sauce and explained in detail what each piece of sushi was, how to use the wasabi to increase the heat of the soy sauce, and how to use the ginger to cleanse the palate in between each bite of sushi. Again I didn’t photograph, as hubby was looking very embarrassed. We also had a side order of steamed rice. I told hubby I was definitely going to have to photograph these so he took himself off to the loo to avoid his embarrassment. 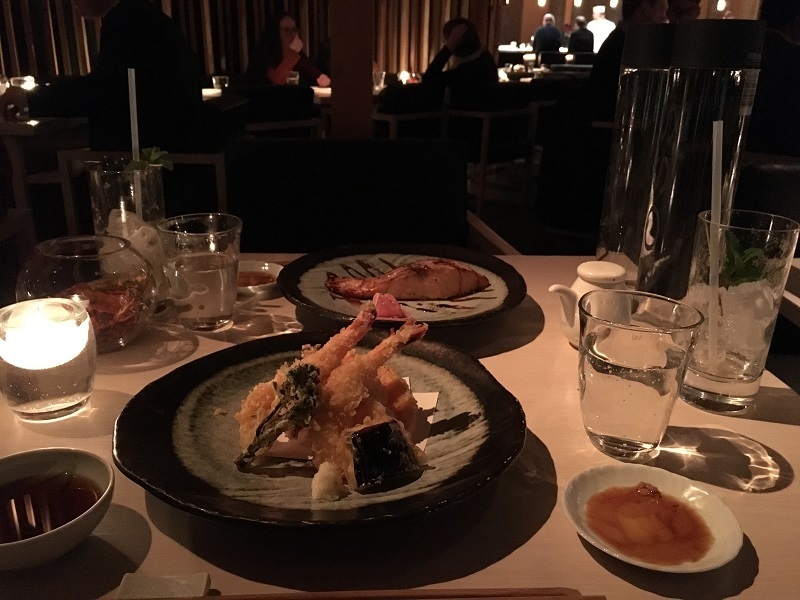 Both main courses were very tasty indeed – the tempura was a huge portion, almost, dare I say too much. I ended up only having a couple of small tastes of the rice and left most of it for my hubby. This was just billed as the Signature dessert, so we had no idea what we were getting. But it was out of this world. 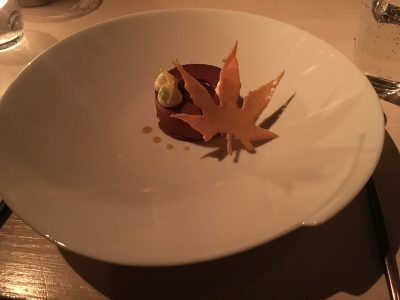 The dessert was topped with a maple leaf, a touch which paid homage to the restaurant’s Autumn leaves theme, which continues throughout October and November. The small chocolate coloured dessert combined warm fondant with a chilled chocolate ice cream, a gooey sweet texture with a small bit of crunch, and it looked almost too beautiful to eat (but I’m sorry, dear reader, I just had to!) There were also a couple of little tiny drops of maple syrup, which added to the appearance, although I must admit, I couldn’t taste them. We finished up with a pot of peppermint tea between us, which went down exceptionally well. Every dish when it arrived was described to us in detail – what was on the plate, and how to combine the food, the dipping sauces and the sides of wasabi, ginger and beetroot, to get the most of the dining experience. And we sat there quite happily until 9.30 and were not pushed to leave even then. When the bill came, it looked as though we had been charged for the cocktails, although I had understood they were a substitute for the wine that was included in the meal deal. However, my hubby had reached the limit of his embarrassment, and he recommended that we pay up anyway and not make any kind of scene about it. The meal had been superb from start to finish and he didn’t want to ruin the atmosphere – and besides which it was well worth the amount that we paid. However, as we got up to go, the head waiter stopped us by the door. “I’m sorry”, he said, “but it seems that we have overcharged you as you didn’t drink any wine. Please step this way and I will refund you”. And so he did, and we departed, smiling and ecstatic. After the refund, our final bill, including the two 5 course dinners, cocktails, 2 bottles of sparkling water, the side order of rice and service charge was still less than £100. For the night we had, I consider that an absolute bargain. 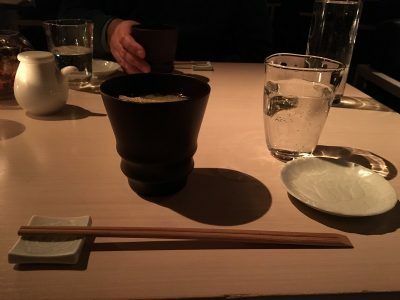 We both enjoyed everything about Sake No Hana, from the decor and ambience, the food and drink and also the amazing service, from the moment we stepped through the door to the moment we left. And now that we know about the London Restaurant Festival we will definitely be back again next year to sample a few more fine dining experiences in town.